Ed. note: This is a continuation of a special series here on HbD with a guest contributor: Mark Majewski, a professional designer with Boston College. He knows college hockey and he knows design, so he’s ranking all the college hockey uniforms in a series of posts, from #60 to #1. We’re damn excited to have him on the site, and hope you like our dive into college hockey aesthetics! Mark’s brief intro and a full description of how he analyzed each school’s uniform is on Part 1 of this series, and we’ll pick it up here by giving a brief summation of that. Enjoy! • Is the uniform identifiable? Who am I watching? Does the brand immediately captivate you? • Lastly, just overall look and feel: How does this color combo mesh with this set or is the shoulder patch too bunched up to the number on the sleeve…just picky little things like that. Please bear in mind, that the rules of college hockey uniforms don’t apply like they do in the NHL. Some schools get new uniforms every year. Some haven’t changed since the 1970s. Some have more combinations and offerings (Michigan State with six!) than some that just have a traditional home set and road set. To start, we are going to focus on the Division I men’s offerings. 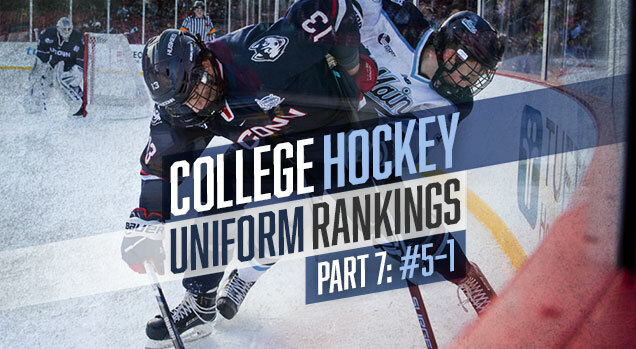 So sit back and enjoy and let the debate begin as we do our best analyzing all 60 college hockey uniforms! You have to feel bad for the Bulldogs as Minnesota Duluth dropped one of the more memorable national championship games to Denver last season, 3-2…but don’t feel too badly! The Bulldogs start off the top five countdown of best uniforms in college hockey. Some may be surprised by this selection, but let me explain why I think Duluth belongs in the top five. Before I get to those reasons, let’s start with some basic acknowledgments. They don’t have anything from top to bottom that knocks your socks off. Pretty basic piping, at least on the main home whites and away maroons. That’s okay, because there are a lot of little things about these uniforms that make them standout from the noise. First things first: as a team, when they’re together on the ice, as they’re shown in the bottom middle part, these uniforms are incredible. That is a huge sticking point for me and will get you a ton of points in my book every time. I think by now you know I’m always a little weary of blowing up a big logo and slapping it on the front, but that Bulldog? There isn’t a more college-hockey lookin’ logo than that dude. 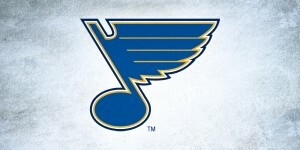 It’s the perfect logo for the front of a college hockey jersey. Sure, newcomers might not know that’s Duluth, but I don’t think they mind. The dog head rules. Now to the little things. Let’s go to the three different shoulder patches, first on the home whites. A HOCKEY NET WITH UMD IN IT!? Or is it a hockey net? I did a lot of scouring on the internet and couldn’t find anything concrete. 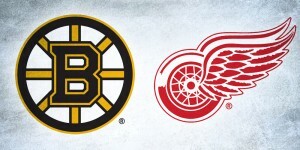 It might also be an outline of Amsoil Arena, as well – hopefully someone can fill me in! But I love it, because it’s extremely specific to Duluth. The maroon’s have the standard ‘UMD’ across the shoulder and that’s just fine. Nothing great, but a good spot to put that. 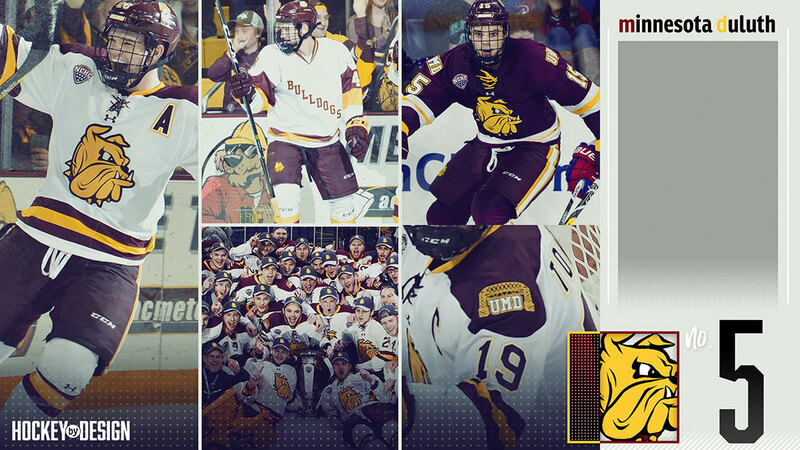 Lastly, we get to the throwbacks that Minnesota Duluth skated out last season. When I was looking for what that patch meant, I came to learn that Duluth has an incredibly rich history of beautiful jerseys from its day. You could remake any of them and they’d look amazing. Apparently these were only worn on Oct. 1-2, 2016, but they should immediately go back to them. I’m referring to the diagonal ‘Bulldogs’ jersey with a beautiful two-patch look on the sleeve with the white number affixed in the maroon up top for a gorgeous look. The thin maroon and gold stripe at the bottom works perfectly to accent that swatch and to top of all off, there is a skating bulldog patch on each shoulder to top off this instant classic. The collar is pretty slick, too. I’m going to get killed for this. I know it. I’m nervous about it. I did these rankings a little while back and although I feel like I might have put UConn a little too high, I’m sticking with my guns here. I’ve seen these uniforms in person many times now and every single time I see them, I always say to myself, “Damn. UConn did a pretty nice job with these.” When I stacked up them up against everyone else? They fared pretty well, I’d say! Okay, there’s nothing absurdly flashy about this, and some might even think they’re a little dull. I’m sorry, but that’s what’s great about the Huskies’ uniforms, here. They could have gone all in with that not-so-great looking new dog head on the front and I just wouldn’t have gone for it. Instead? UConn went with that classic, “UCONN” wordmark that you’ve seen so many times in the NCAA Final Four and nothing more. They let such a small, short wordmark breathe all on its own on the front and let it speak for itself. Connecticut didn’t get tempted by slapping numbers or a bunch of crap on the front. They stood true to the name and let that do all the talking. Kudos. …and it looks good!! 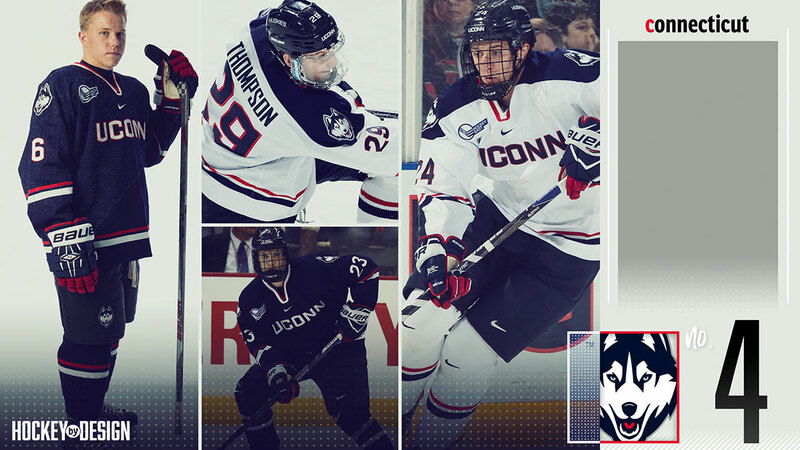 A fantastic color scheme branded as well as a UConn hockey uniform could be. The husky head marks are a perfect shoulder patch and, you guess it, that’s exactly where they are. I love how the Nike swoosh accents these even more, showing off UConn’s Nike brand. Normally, I don’t care for the shoulder yoke, but on the whites, that solid blue look up top works well. It’s a great contrast and goes amazing with the blue pants. Do we see any stripes on those pants? Noooope. Don’t need ‘em. The red and white trim on the blues and the flipped red and blue trim on the whites is perfect Subtle enough to not go overboard, but powerful enough to hammer home that color scheme and the UConn brand. I also love the legibility of the number font and last name on the back of the uniform, accenting that UConn brand even more. Is number four a little high for UConn? After writing this review, I’m confident they belong in the top five. When you think of Big Ten hockey, the traditional powers that be come to mind: Minnesota, Michigan, Wisconsin, etc. Does Penn State? Well, when your program’s only six years old (at the Division I level), it’s hard think of past steeped in rich history. Outfit with a gorgeous facility in “Hockey Valley”, the Pegula Ice Arena, the Nittany Lions have an equally gorgeous set of uniforms to go with it. Penn State’s white hockey uniform is one of the most beautiful things I’ve ever seen. Shoulder markings? Nope. Crazy lines or unnecessary markings? Nah. Just a clean, white jersey with that icon Nittany Lion logo in navy blue with one, thick-blue stripe corresponding with sleeve, jersey and sock, a crisp number scheme and an absolutely marvelous inverted last-name bumper plate on the back to the just seal the deal that Penn State belongs in the top 3 of the college hockey pantheon of uniforms. The navy blue version is a 100% flip of the white uniform but PSU stuck with the blue pants (…smart move) for this very powerful, blue look. For me, it’s the back of the jersey that sells this more than anything. Yes, UMass does it, but Penn State has made it they’re brand, installing this look on all three kits. It’s excellent, and actually may look the best on the alternate grey uniform. Out of the three, I prefer the grey alternates the least, even though I think they’re still excellent. I think if PSU got rid of that circle where it said “Penn State Nittany Lions” and just stuck with the logo the other two sweaters have, and utilized that lovely horizontal stripe along with it, I’d be here saying they’d be my favorite. I think it’s cool they have a uniform that’s able to say “Penn State Nittany Lions”, fitting a ton of characters into a clean, legible format that looks good. I don’t see any stripes on Penn State’s pants, either. Starting to see a trend here? I think stripes on hokey pants can detract too much from the piping on the sweater. That’s where the focus should be and the plain, blue pants Penn State has allows you to focus on the beautiful simplicity they’re constructed here. Lastly, the helmets. It’s all in the details. 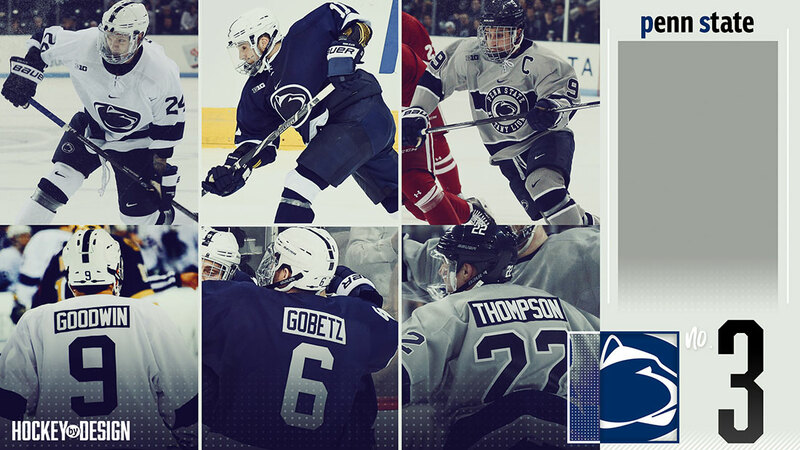 Much like Penn State’s famous football helmets, the hockey program pulled off the thin, blue stripe on a plain white helmet flawlessly. The white number inside the stripe on the front is great as well as the larger, blue number on the back. Penn State, the second newest member on the college hockey Division I block has itself the third-best looking uniform in the game. Bravo. We’re not going to spend a lot of time on this one here, folks. Because a lot of what I’ve described as not liking on college hockey uniforms, as well as a not-so-great third jersey, is prevalent in this look. But I don’t care. 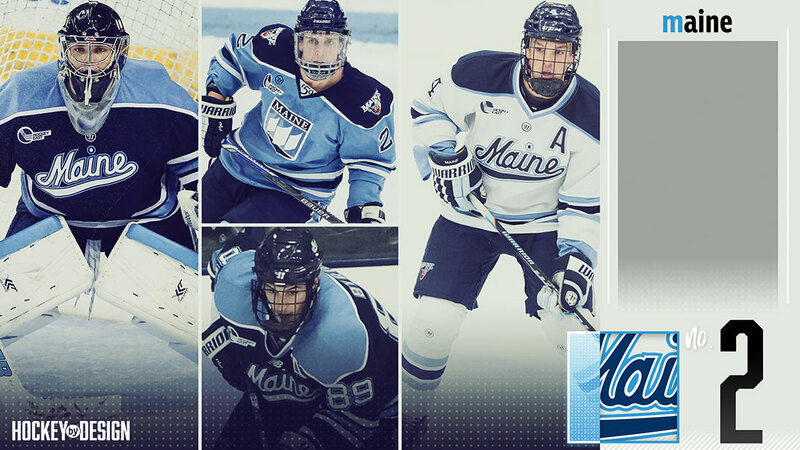 Maine is arguably the most iconic college hockey uniform of all-time and would be No. 1 if it wasn’t edged out by a look I can’t get out of my head. The shoulder yoke? On the white? Yeah, it’s not great. But you know what? It’s Maine’s. They perfected it and they can do what they want? Why? Because the script ‘Maine’. That beautifully crafted, classic and bold Maine script, with the best double stroke you’re going to find on the front of a jersey, is the epitome of what college hockey is all about. The baby blue with the navy blue. The best color combo in college hockey, if not sports! Is Maine’s primary athletics logo pretty bad? That’s putting it nicely and I wish it wasn’t anywhere on this beauty, but I’m not going to let it tarnish the most iconic look in the game. The way the number and last name on the back of the jersey mimics the front is what sports uniform lovers dream about. Stop. Just look at them. Look at every little detail. The contrasts. The colors. The cleanliness. The uniqueness. 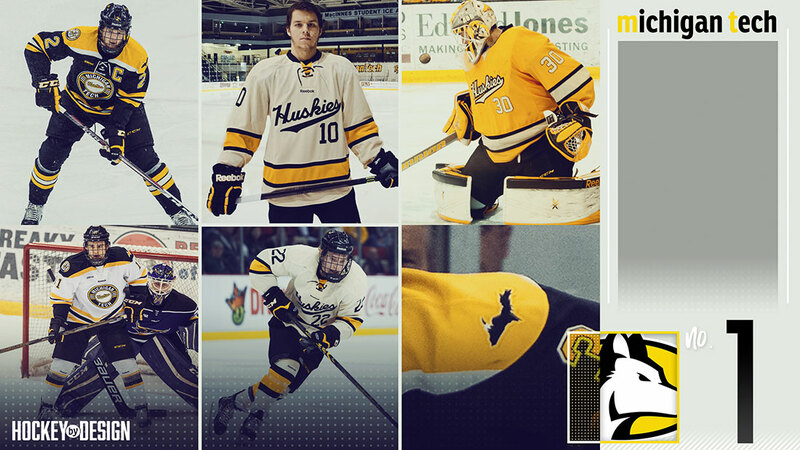 Michigan Tech easily runs away with the best college hockey uniform in the US of A. Have you ever been to Houghton? Even heard of Houghton? Well, it’s just a short nine-hour commute from Detroit, in the tippy-top of the upper Peninsula. Anyone who has the luxury of taking in a WCHA college hockey game at MacInnes Student Ice Arena will bear witness to the one college hockey uniform(s) that looks better than all other 59 squadrons, particularly when they’re all together as one. Let’s get this out of the way. This is difficult for me to say this, but I’m not crazy about the white and black circle logo uniforms. The shoulders stink. The circle stinks. What doesn’t stink is the star on the Upper Peninsula showing you exactly where Houghton is located (yes, people DO live up there…for some reason). MTU also showcases a school crest on the opposite shoulder, which is cool too. Okay, now that that’s out of the way – let’s get to the best of the best. I mean, I feel like I can stop writing. All you have to do is look at them! But let’s start with the whites, excuse me…creams. This is honestly the first aspect that won me over about these. 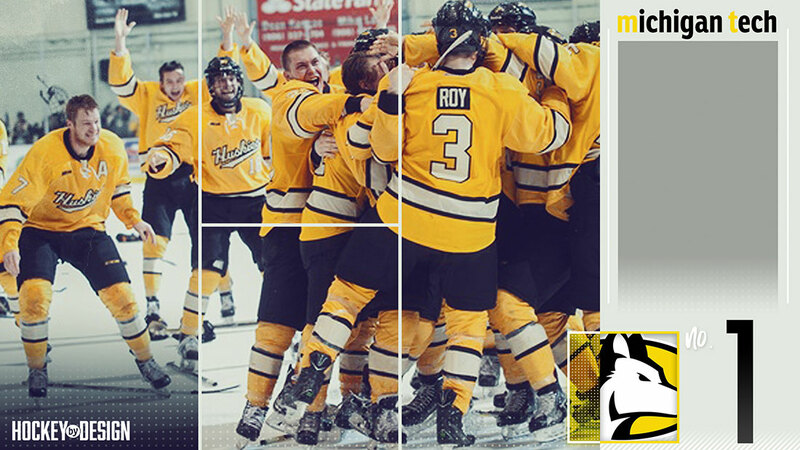 Michigan Tech opted for an egg-white, cream color instead of a white sweater, giving it that nostalgic look, and that’s before getting to everything else. Let’s break every aspect down…the most noticeable, and beautiful aspect? The ‘Huskies’ script. It’s better than perfect. It’s legible, it’s unique, it’s bold, it’s college hockey. The jersey number tucked in underneath the script? An even better accent and love that it’s all in black. No trim. No strokes. Just script mark and number. It’s perfect. Shoulder markings? None. Why would you take away from the front by putting anything up top? A simple, black number on the sleeve is all that should be added here, and that’s exactly what you get. The colors. Ooooooh my, the colors. If you told me that an off-white, cream color and bright gold would go together without actually seeing it, I’d tell you you’re crazy. Yet, with accents of black, this color combination is unmistakable and as aesthetically pleasing as you could ask for. The arm and bottom of jersey trimming is classic and bold enough to drive home this color palette, making a statement without taking away from the charm of the fronts. The neck may actually be my favorite part. A black color coupled with a black hockey lace tie and the bright gold plate underneath is the ultimate combination. The pants? Black. Just black. This uniform isn’t about the pants and the blackness of the pant draws your eye more to the tops. It’s the perfect compliment to the sweater. The backs are a thing of beauty, as well. A plain, black number with no stroke and a black nameplate with the cream lettering. Voila. The gold uniform is pretty much an identical switch over from the off-white creams, and it presents a pageantry of its own. I don’t know to go into all the minor details as they’re the same as the off-whites, but what stands out most to me is the how the lettering and lining of the cream color on those bright golds is so unique and vibrant. The backs of those uniforms, with the black name plate, off-white lettering, off-white number and black stroke is next-level. I understand that these are a remake of what Michigan Tech had back in the day, but that’s oaky. It’s as collegiate as it gets and no detail is spared. That’s the point of a uniform. To look like a team. My favorite uniform of all-time in the history of sports? I’ll be honest, sometimes it goes back and forth, but Sweden’s Olympic hockey uniform (the yellows, duh), I think are the best off all-time. The three crowns on the front are so badass I don’t even know where to start. That’s what the focus is and nothing else detracts from it, thusly, when they’re paired together, they look very united. That’s why I think these are No. 1. 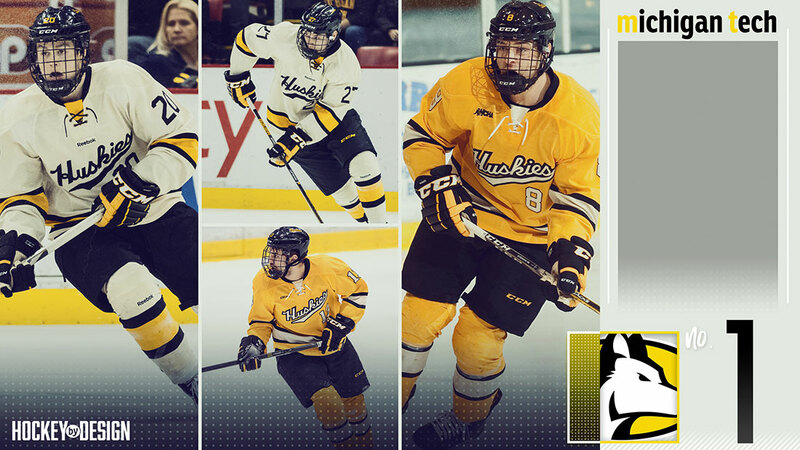 As a whole, Michigan Tech’s off-white cream and gold uniform combo(s), together, are the best of college hockey. The patch on the shoulder of the Minnesota-Duluth jersey is the Aerial Lift Bridge in Duluth. (https://en.wikipedia.org/wiki/Aerial_Lift_Bridge). If you’re going to talk about details, contrast, and consistency. Michigan Tech leaves a lot to be desired. I’ll leave alone the fact that the front looks like a baseball jersey. It is what it is. The weights of the sleeve and sock stripes are *in*consistent on the cream uniform, with the black trim being inexplicably heavier on the sock. The numbers on the gold uniform have very thin trim (instead of the heavy trim that sets off the script so nicely), a *detail* that ruins the cohesion between the script and numbers. The cream on gold numbers also lack sufficient *contrast* with trim that thin. 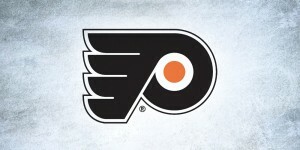 They need to take a page out of the Flyers’ book and beef up that outline. I’d also argue that the top area is too plain with no yoke and no patch, and they get docked for not having their school name depicted on the uniform. Hey man, appreciate your passion here. Don’t agree with your rankings (I appreciate clean and classic as well, but Penn St and UConn? zzzzzzzzzz). Anyway, that’s what makes this fun – everyone has an opinion! 1) the patch is the Lift Bridge in Duluth – icon of the city. I can’t believe you couldn’t find anything on the internet about it. Weird. Posting about the UMD “net” logo like Antonio. No doubt that’s the lift bridge, as he said and icon of Duluth. Much like the Portage Lake lift bridge here in Houghton, MI. 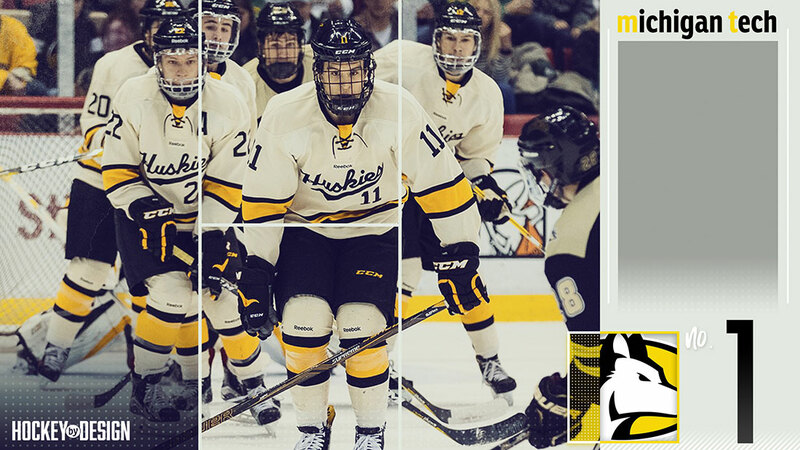 How are you liking Michigan Tech’s new Blacks? We make the given below items for Males, Females and Youths etc. COMPRESSION WEAR: (Shorts, 3/4 and full tights, shirts and singlets). FITTED WEARS: (Shorts, long pants, shirts, tank tops and singlets). LOOSE WEARS: (Shorts, Pants, Half Tops, Singlets and Tanks). THERMAL LAYERS: (Long Pants and Long Sleeve Shirts). SHIRTS AND TOPS: (Cotton T-shirts, Polyester Shirts, Hoodies and Sweats). TRAINING WEARS: (Shorts, Capris, Pants, Shirts, Warm-Ups). ACCESSORIES: (Sleeves, Calf Guards, Gloves and Socks). We can make them with your logos in our or your designs. We make top quality and provide excellent service with reasonable prices. Looking forward to receive inquiry, thanks in advance.